cotton | Stitch, Brinn, Stitch! You are currently browsing the tag archive for the ‘cotton’ tag. 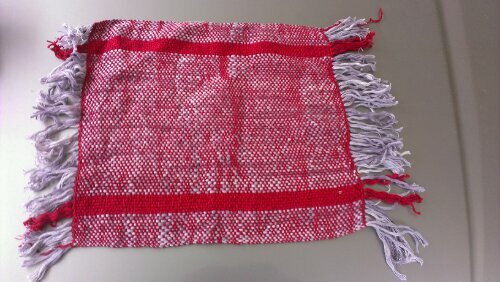 I’ve been on something of a towel kick in my weaving these days. 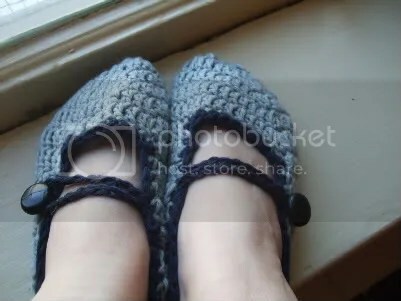 They’re useful and I have a lot of cotton yarn. Here are some quick ones I whipped up the other day on my 24″ LeClerc. This was my first attempt. The tension was… Bad. Really, really bad. 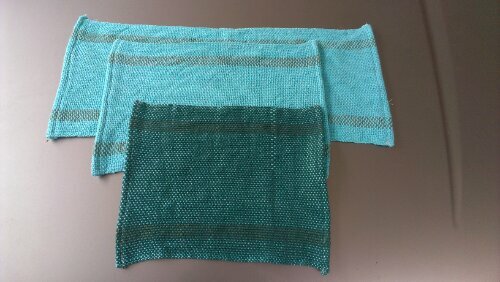 I wanted to get a longer towel but I had to take the whole project off the loom. I have the warp though. Maybe I’ll use it on the inkle loom. The next set came out much better. I must confess I don’t know what the blue is. Some cotton I got at a thrift store. There are warp stripes of green Sugar and Cream but I’m not sure how well you can see them. I ran out of the blue and finished the warp with a recycled cotton/acrylic. So that’s the green. They’re finished off with a rolled hem, super simple. The fabric is pretty squooshy and I think I’ll get a lot of use out of them. 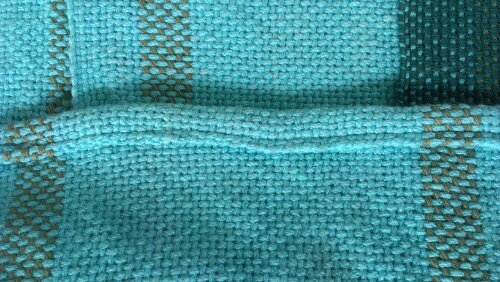 I’ve currently got a big towel warped up using just about the whole width of the loom. I think that one will take a bit longer to finish as I haven’t been working on it quite so dillgently. Life things: leaving for Virginia Beach on Wednesday. Joe and I finished the first Jedi Academy book and have started the second. Still watching Star Trek. Totally bummed I missed megacon, a con in Orlando, by two weeks. Oh, and this Saturday is the Uniquities Fiber Market in Vienna. There’s another event on Sunday about an hour away in Maryland that I might go to. And Maryland Sheep and Wool is in less than a month and a half and I am so going. And probably spending so much money. Buy all the fiber! Pattern: My own! Which I am writing up and will be available for test knitting… soonish? Eventually. I love this tank. I basically made it up as I went along (I took notes though), and it’s got waist shaping, a slight A-line flare, and a deep v cut. Love it. I suspect it’s a shape that looks good on a lot of people, though the tiny straps might be too tiny for some. I find it’s super comfortable. 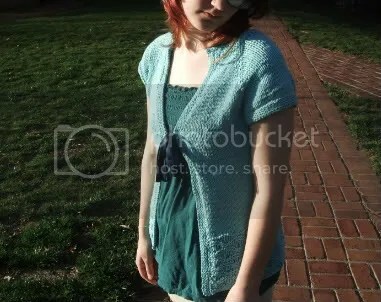 I knit mine a little short (I was worried about the yarn I had) so I have to wear it over a tank top (otherwise it’s opaque enough to just wear a bra under). 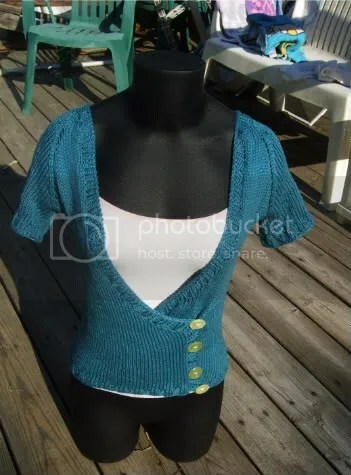 I’ve written up the pattern and it’s currently undergoing test knitting, and I anticipate it being ready about the end of July. 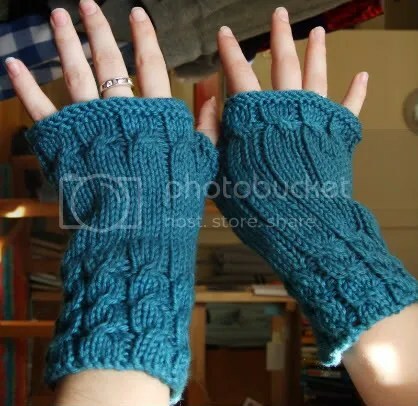 Which is a little late in the season, but it gets pretty hot many places in August and September, so it should still be appropriate knitting: cool fiber and no long sleeves to try on. I’ll keep you guys posted when it’s available, of course. 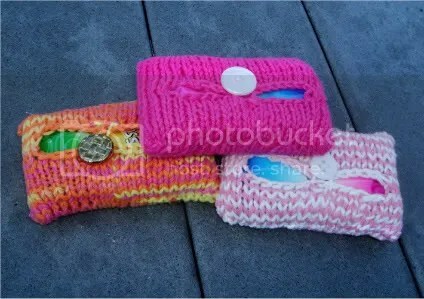 All right guys, I finally finished and sent my swap package for the Yarnie vs. Sewists swap on Craftster. My partner was MissDolly, and we decided to craft each other’s lists (we each had five items). Here is everything I made for MissDolly (and warning–the last one is probably NSFW). 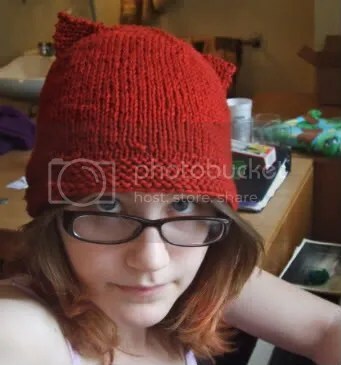 Pattern: None, it’s a top-down hat. Yarn: Grants Knitting Worsted, the vintage wool I’m slowly working through. I like how this came out. It’s not overly complicated and the ears and a little crooked but it’s cute. And comfy. 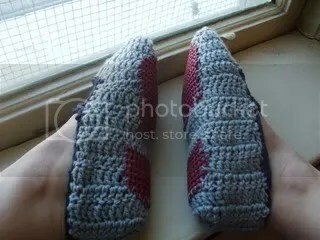 Pattern: The Mary Jane Slippers I’ve made three pairs of now. Mods: None, I think. Crocheted as written. Every time I make these, I like them more. 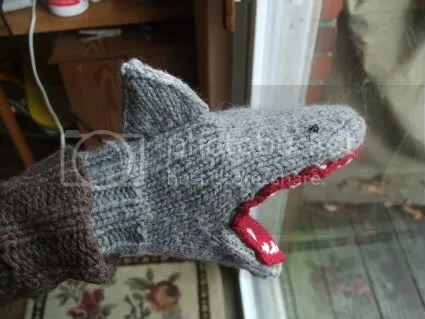 One of these days I’ll make a pair for myself. 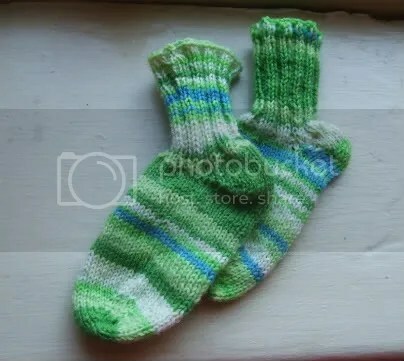 In the mean time, I’ll continue making them for swap cause they’re SO FAST and they’re a great use of random wool or acrylic that I have lounging about in the stash. Also, great use for buttons I only have two of. A while back, I picked up a couple of shelf liners/placemats (one of those things) at Goodwill. 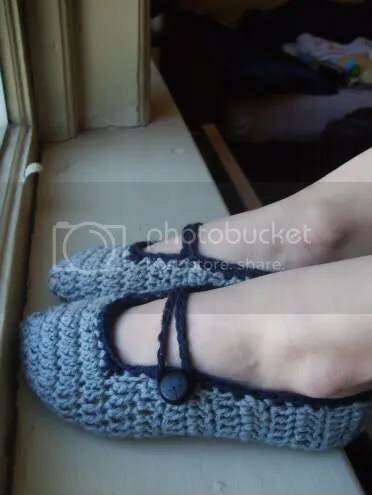 They’re kind of sticky, and I figured they’d be good for sewing to slipper bottoms so the slippers aren’t so dangerous and so they last longer (since pure wool crocheted loosely that gets stepped on a lot probably won’t last very long). Mods: None? Though next time I would do a little shaping and a different thumb. I hate afterthought thumbs. Pattern: My own; made it up as I went. Hook: Uh… G maybe? For amigurumi, I generally just use whatever hook I pull out first. I think I used a 3.75 mm hook. Guys, I love this rabbit. LOVE. I was convinced it was going to come out horribly, and then I put it all together, and it’s AMAZING. 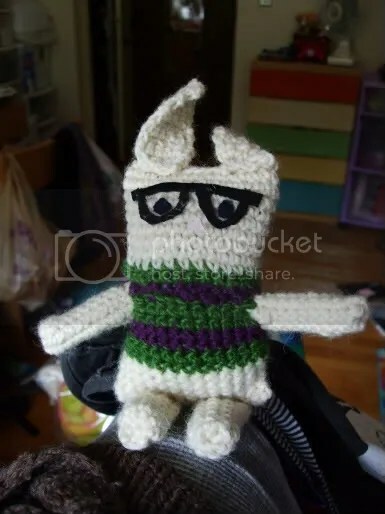 I’m seriously considering making another for myself to sit on my desk and be cute and nerdy. 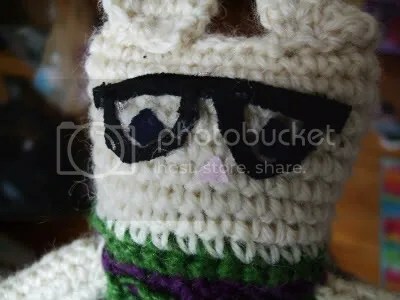 His little glasses (scraps of jersey I glued on) are adorable. LOVE. WARNING: This next one is NSFW or kids. Though you should expect this sort of thing from time to time since the name of my blog is “Adulterous Whores Club.” Just sayin’. Yarn: Wool from a thrift store sweater. 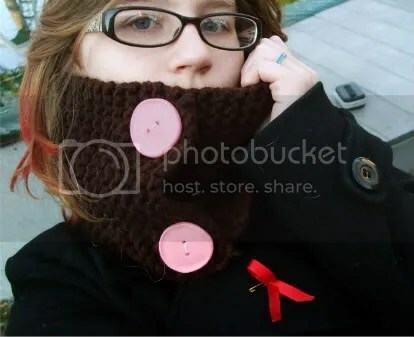 Mods: Made adjustments for thicker yarn, stuffed it fully instead of leaving space for chapstick. …Yeah. It was fun to make, and she wanted one, so I obliged. You know you want one too. 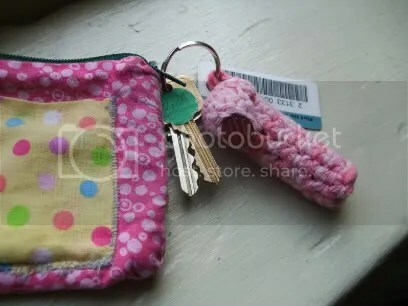 Mods: I followed the size for the child using a smaller yarn and needles, hoping it would come out about baby sized. I think I accomplished that. I also, obviously, left off the face features. Pattern: Mostly an amalgamation of various baby sock patterns. Mostly I made it up. No idea when they’ll fit the kid but I imagine they will at some point. Also, I did one cuff down (I started with a pattern) then did the other toe up, as I prefer. Both have a wedge toe and short row heel. 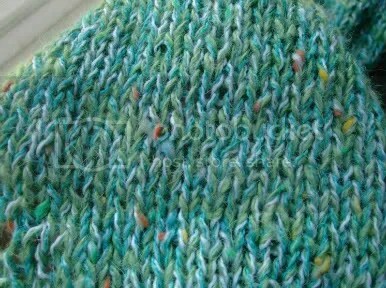 Needles: US 6/4 mm, which made for a super squishy and wonderful seed stitch. Mods: Changed the icord ties to crochet chain/single crochet because it was faster that the icord would have been. I totally love this bib. 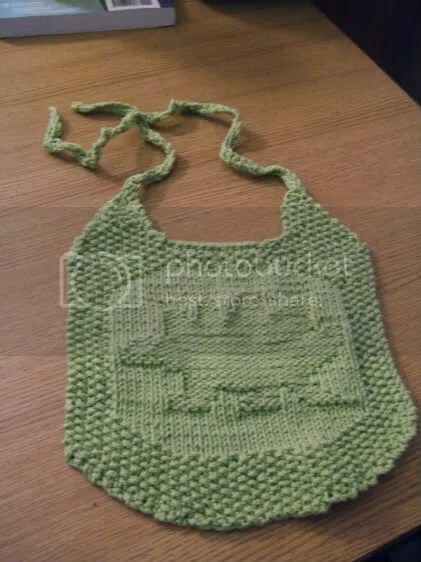 The pattern was fun, it’s super cute, and the cotton-ease is SO wonderful and squishy on the 4mm needles. Anyway, I hope the parents-to-be like the things I made for Sarah to give to her cousin. At the very least, they were lots of fun to make. 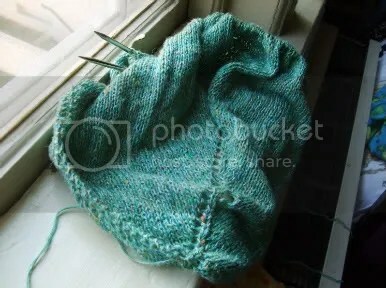 Pattern: It’s garter stitch. Seriously. 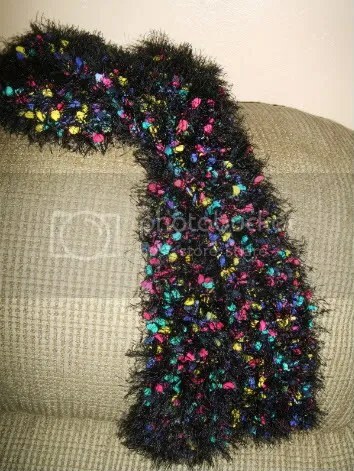 Yarn: Lion Brand Fancy Fur in “Bold Black”. Three skeins. So, yes, Bufada Del Diablo. The Devil’s Scarf. A, novelty yarn. B, two strands. C, apparently the two skeins I had in my stash weren’t enough, so I literally drove all around town today trying to hunt down more. I tried Dollar Tree, Big Lots, Michael’s, and two different Tuesday Mornings before I found a skein in a clearance bin in AC Moore. BAH. Anyway, this scarf is for one of my mother’s friends at work. She’s paying me for it, so it’s not like I just make scarves and run all over town for random people my mother knows. 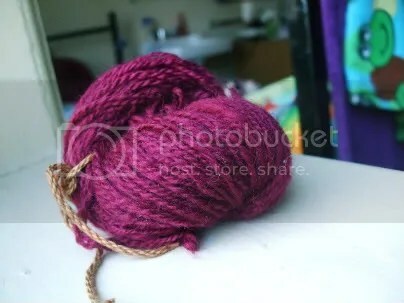 I am giving her a cut rate deal though, mostly cause it helped get the damn yarn out of my stash. I don’t actually have a recipient in mind for these, as I’m putting them up for sale on my Etsy and my Artfire. Or, I will. At some point. Yeah. Pattern: None. 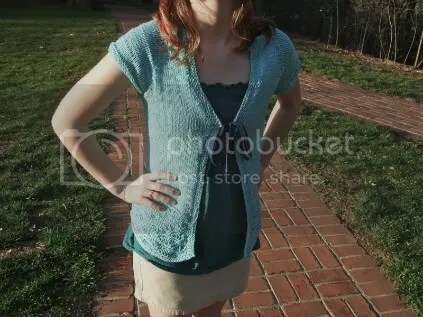 It’s a garter stitch rectangle with buttons and button holes. Needles: Uh… US 9 or 10? I don’t remember. 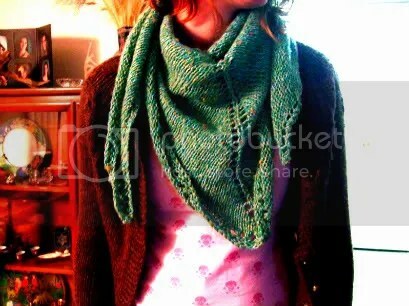 A big, chunky cowl to keep you warm for winter. : ) The buttons are hand-made by me out of Fimo (or similar brand; I don’t recall) clay. 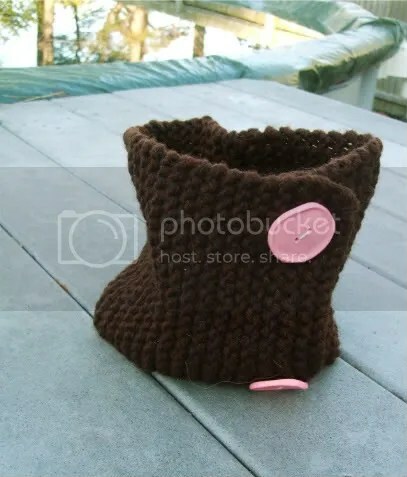 It’s super cozy, and I’d keep it for myself but I can only use so many cowls, ya know? Available on Etsy or Artfire. 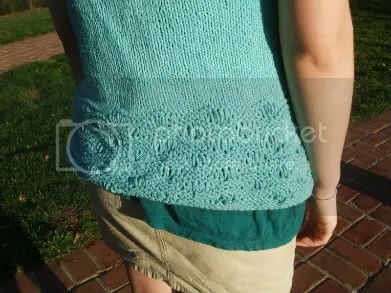 Pattern: It’s a triangle with eyelets. Do you really need a pattern? Yarn: Combo yarn I got in a swap. 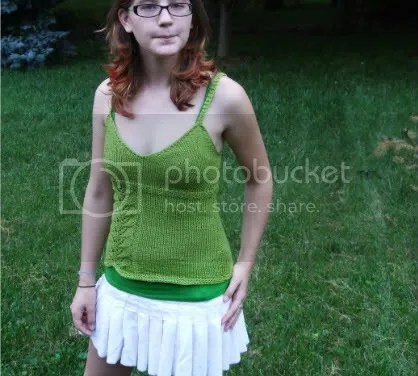 I believe it’s silk and cotton. This came out exactly how I wanted it too: large and warm. It’s a lovely scarf. It’s cotton, so it’s not the best fiber for winter, but until I get around to knitting a wool triangle scarf, this will do. Plus I love the yarn. The light green strand, the silk, is shiny and soft and the cottons are nice too. The tweed bits are interesting (though I think I’d have preferred to leave them out). So what else is going on? Well, Ongoing Wish Swap is happening. I’m expecting two packages hopefully in the next two weeks, otherwise I’ll have to wait until I get back to school after winter break. 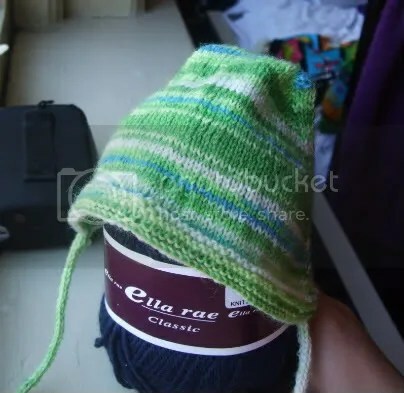 I’ve also finished a hat, which I’ll hopefully post on Monday. I’m also working on a pair of vanilla socks, as I mentioned yesterday, I think, and those will probably show up on Wednesday. After the socks, there might be another break in posting as it’s the last two weeks of the semester starting Monday (a week of classes and then a week of finals), and I have a ton of schoolwork to finish in that time. But I’ll give you a better update then. Stay tuned! Yarn: Lily Sugar N’ Cream, colorway was like, strawberry or somesuch. Mods: Probably? 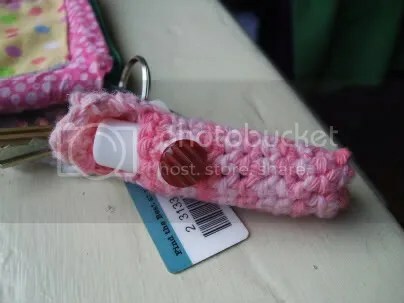 Added a loop to attach to my keychain. It’s functional, and that’s great. Whee, always having chapstick! I’m totally addicted. Thing number two: A spinning FO! Fiber: Random wool I got with a spindle on Etsy. An ounce. Weight: About sport, I think. 2 ply. Yardage: About 88 yards to my rudimentary measurements. Probably this will become some sort of lacy cowl because I love lacy cowls. Probably with buttons so it doesn’t have to be wide enough to get over my head. 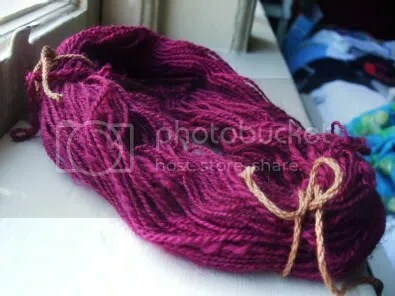 The yarn actually came out quite soft, probably due to its SOAK bath. I bought the Ravelry edition from the minimart, and I LOVE the scent. Really, it’s great. The true green is the silk, I think, and the white and the teal/blue are cotton. The shawl is looking to be quite large, which I’m cool with. 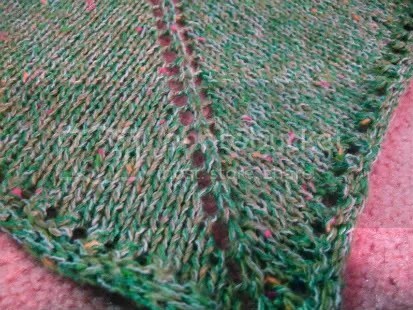 I want to do some lacy edging on the edge, but I haven’t found anything I like, so I might just have a boring triangle scarf. The yarn is the prettiest part anyway.